107 Marlborough is located on the north side of Marlborough, between Clarendon and Dartmouth, with 105 Marlborough to the east and 109 Marlborough to the west. 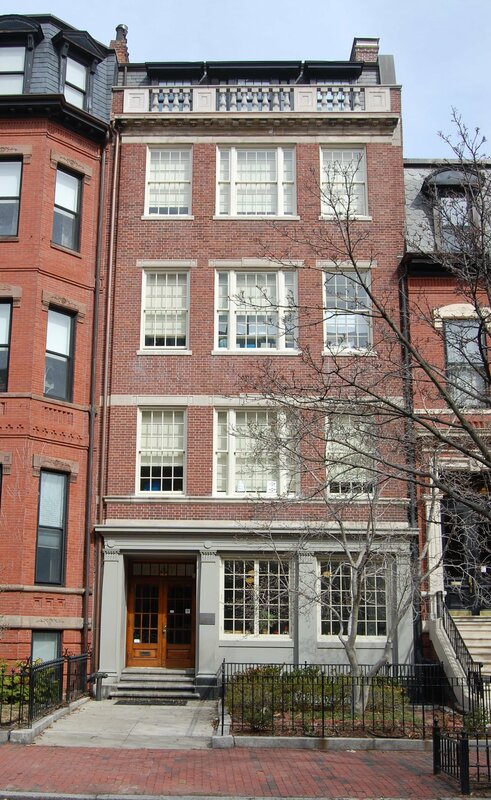 107 Marlborough was designed as a private school building by architect James Stearns Lee and built in 1916-1917 by William S. Crane, builder, for James Stearns Lee’s sister, Frances Lee, replacing an existing townhouse. Frances Lee purchased the former townhouse on January 12, 1916, from Charles Henry Fiske, Jr. On November 29, 1916, she applied for (and subsequently received) approval to construct a new building on the site, and on December 22, 1916, she received approval to demolish the current building. 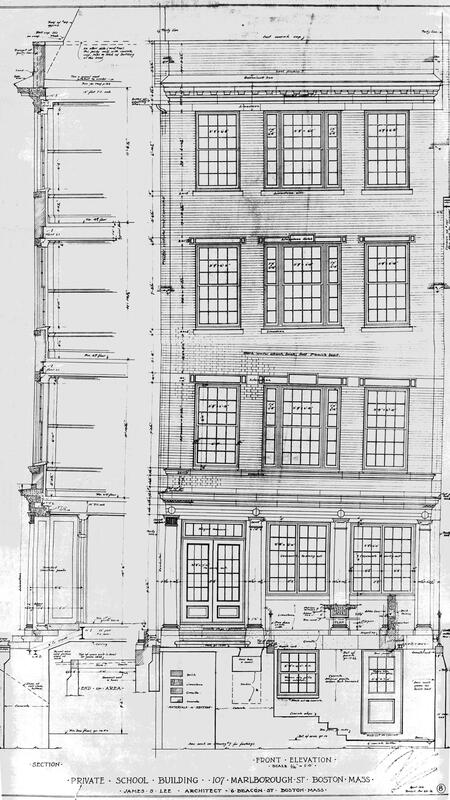 Architectural plans of the building — including elevations, floor plans, and foundation and pile plans — are included in the City of Boston Blueprints Collection in the Boston Public Library’s Arts Department (reference BIN C-45). Click here for an index to the deeds for 107 Marlborough. Frances Lee was a graduate of Radcliffe College, the daughter of theologian and educator James Hattrick Lee, and the granddaughter of William Augustus Stearns, president of Amherst College. She was associated with Miss Bertha Carroll’s School for several years and became her successor in 1912, located at 344 Marlborough. After 107 Marlborough was completed, she moved her residence and school there. Miss Lee’s School (later The Lee School) was a day school that provided college preparatory and general courses for girls, and also prepared boys for secondary school. A marble tablet in honor of Bertha Carroll was installed in the east wall of the new building. 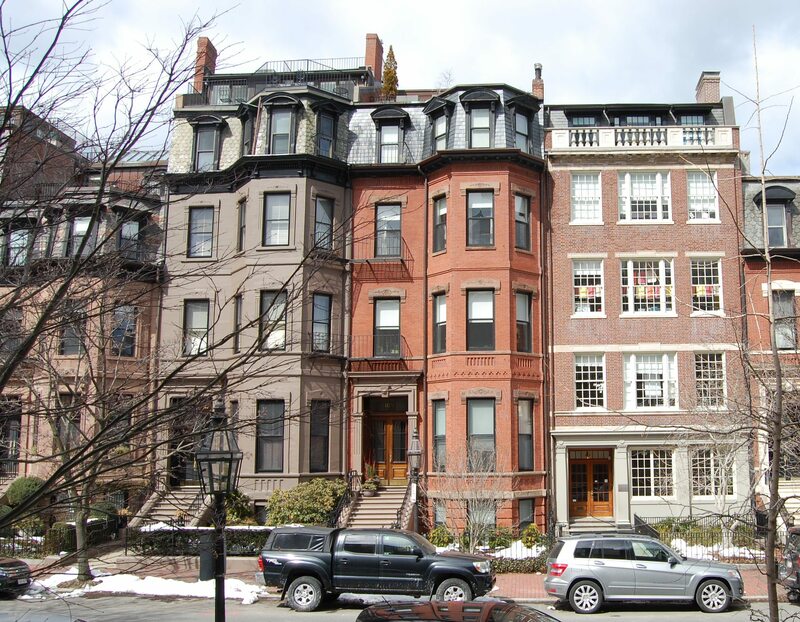 In about 1921, she leased 105 Marlborough and moved her residence to that house. She continued to operate the school at 107 Marlborough. In September of 1926. she acquired 105 Marlborough and transferred ownership to the Lee School. In 1937, the Lee School closed due to financial difficulties. On June 29, 1937, the Suffolk Savings Bank for Seamen foreclosed on its mortgages on 105-107 Marlborough and took possession of the property. Frances Lee moved and became the national supervisor of leader training for the Girl Scouts of America. On September 16, 1937, the Mary Brooks School acquired 105 and 107 Marlborough from the Suffolk Savings Bank for Seamen. The Mary Brooks School specialized in training medical lab technicians and secretaries, and in teaching other para-medical skills. It previously had been located at 132 Newbury. The school operated primarily at 107 Marlborough. In the mid-1940s, 105 Marlborough became the home of George Francis Brennen and his wife, Jane Elizabeth (Brooks) Brennen. Jane Brennen (who kept the name Jane Brooks in her profession) was the founder, president, and treasurer of the Mary Brooks School and George Brennen was the corporate clerk and business manager. Jane Brennen died in February of 1951, and by the mid-1950s 105 Marlborough had become a dormitory for the school. It was sold in August of 1975. In 1978, the Mary Brooks School was merged into The Learning Project, a private elementary school, and 107 Marlborough became the site of The Learning Project School. It remained The Learning Project in 2016. 107 Marlborough was designed by architect Charles K. Kirby and built ca. 1871, for speculative sale, one of three contiguous houses (105-107-109 Marlborough) built at about the same time on land he purchased from the Commonwealth of Massachusetts on October 15, 1870. He also designed three more houses immediately to the west, 111-113-115 Commonwealth, built ca. 1872. 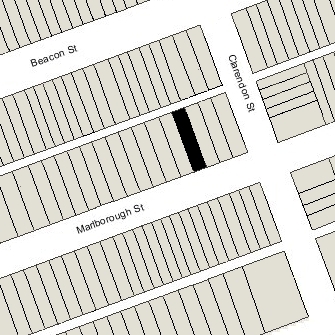 Based on the Bromley maps, it appears that 107 Marlborough was designed in the same style as 105 Marlborough, with a basement and three stories, whereas 109 Marlborough was one story higher. On September 15, 1871, 107 Marlborough was purchased from Charles Kirby by Anna Maria (Warren) Glidden, the wife of John Murray Glidden. They previously had lived at 230 Beacon. The Gliddens continued to live at 107 Marlborough in 1877, but had moved to 10 Marlborough by 1878. On January 20, 1877, 107 Marlborough was acquired from John Glidden by Margaret (Fiske) Watson, the wife of William Watson. They previously had lived at 73 Marlborough. William Watson had been an instructor of mathematics at Harvard from the time of his graduation in 1857 until 1860, when he traveled to Europe to study where he gathered information on the European polytechnic university model which subsequently formed the basis on which the Massachusetts Institute of Technology was organized. From 1865 through 1873, he was a professor of mechanical engineering and descriptive geometry at MIT. He later became Secretary of the American Academy of Arts and Sciences. Margaret Watson died in March of 1886. William Watson continued to live at 107 Marlborough until his death in September of 1915. The Watsons had no children and, after his death, 107 Marlborough was inherited by Margaret Fiske’s siblings. Her nephew, Charles Henry Fiske, Jr., an attorney, consolidated ownership of the property through a series of transactions in the fall and winter of 1915. In January of 1916, 107 Marlborough was acquired from Charles H. Fiske, Jr., by Frances Lee, who subsequently razed it and replaced it with a new building for her school.